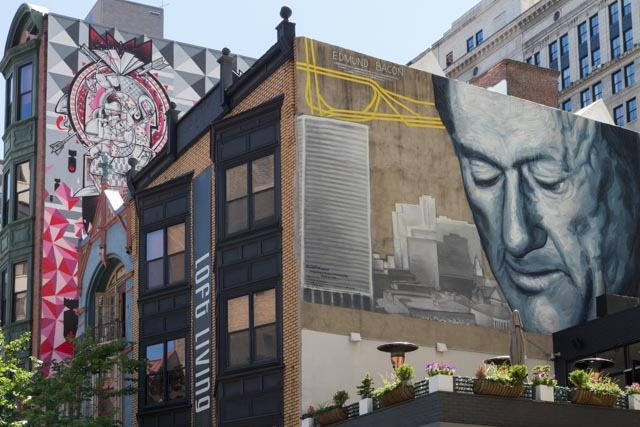 Philadelphia is an amazing city, it has history, sports, food, culture and great street art. On a recent trip I took the opportunity to walk the streets of the central city and enjoyed the sights and Philly Cheese Steak Hoagies! I also saw some great street art and took some photos and I am sharing seven of the best with you in this post. The day started bright and sunny and then the thunderstorms rolled in and I got soaked. This did change the lighting for some photos and I think a few benefited from the soft lighting right after the rain. Several of these images were in rather tight spaces, so I had to use the wide angle lens a few times. I am getting used to using Adobe Lightroom 5 and it is improving my photos. There are several photos that exhibited keystoning and Lightroom made great adjustments to eliminate this effect in those photos. I was also able to use the Graduated Adjustment Tool in a few pictures to decrease some brightness in the sky. There is a temptation to overuse Lightroom, so I am trying to limit the adjustments to basically the minimum needed to improve the photo. The tool that is still giving me trouble is the cloning or healing tool when I try to remove something distracting in the photo. One picture in particular did not turn out as well as I wanted, so I guess more practice is needed. Overall, I am pleased with these photos and it looks like my photographic and post-processing skills are improving. I hope you enjoy these photos and I am looking forward to my next post and hopefully, those pictures will be even better. I am planning on posting pictures from my trip to Blackwater Falls in West Virginia. Nature photography is a departure for me, so lets see how I do on that. On May 7 I visited Washington DC trying to locate some murals. While on Georgia Avenue near Howard University I caught sight of the first mural on the side of a small grocery store. 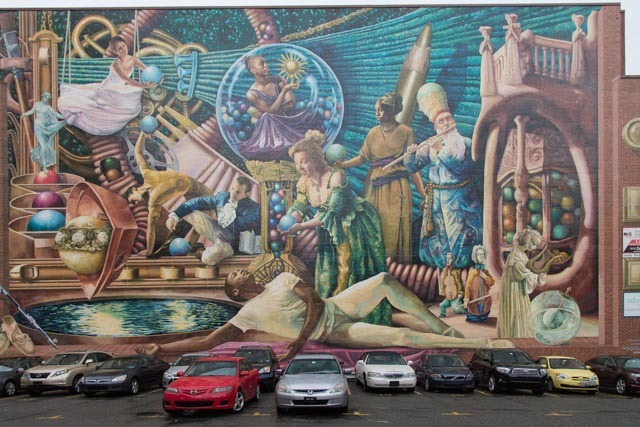 As I read the information about the mural I learned that it was part of a project of the DC Commission on the Humanities and the Arts. It was raining and this probably had the effect of making the photographs a little less luminous. I suspect in brighter sunshine these photographs would stand out more. Although the trade-off was very even lightning with no harsh shadows and on balance maybe this was a better day for shooting after all. 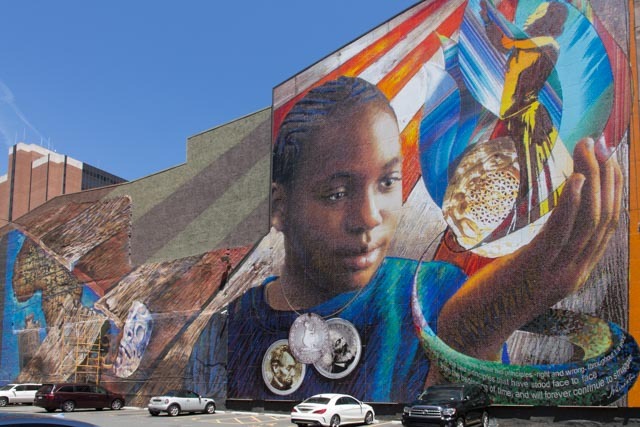 If you want to learn more about the DC Commission on the Humanities and the Arts Mural Project you can visit them at http://dcarts.dc.gov/page/muralsdc. Photographing street murals is a fun project but there are some difficulties in getting a proper position for taking the photos. Sometimes there is not enough room even with a wide angle lens. This is further complicated by the height of the images. In some instances, street traffic restricts where you can stand. That said, this looks like a fun photo project. 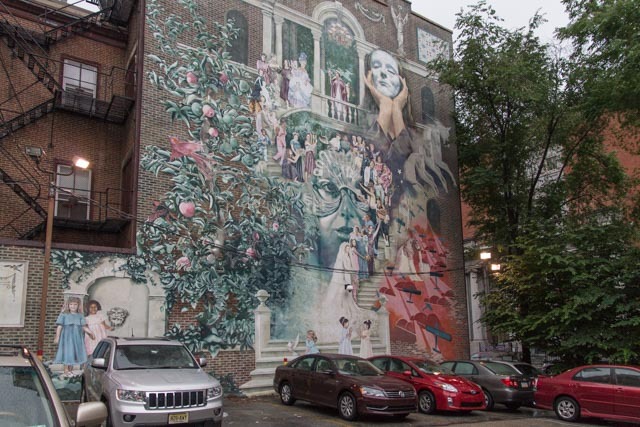 I have been amazed to learn about some of the many websites that feature mural street art all over the world. Pinterest has been very helpful in showing me many of these beautiful and interesting images. I have been giving some thought to different themes that I could use for my photography. Because I have always lived in cities, I decided that focusing, no pun intended, my photographic efforts on street scenes would be most appropriate. In the world of photography, this is typically called Street Photography. I spent some time on the web looking at different examples of street photography. Some of the blogs that I have been reviewing also featured street photography by excellent photographers. This started to give me some good background on what street photography looks like and some of the perspectives and other techniques that photographers use to capture this art form. 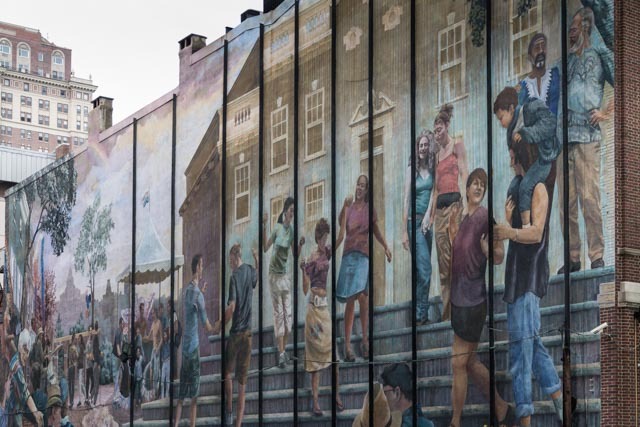 Recently, my wife and I visited Baltimore Maryland and as we were driving through parts of the city I started to spot fantastic art painted on the sides of buildings. This was not graffiti, it was creative art by street artists capturing the spirit and ethos of urban life as it exists today. This gave me an inspiration to use these examples of street art in my photographic hobby! 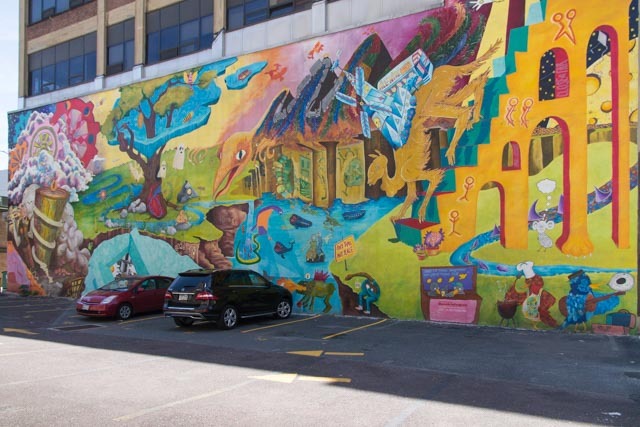 Most of the artwork that I had the opportunity to photograph was in the following neighborhoods: E. North Avenue, Latrobe Street, and the Coldstream Homestead Montbello community. 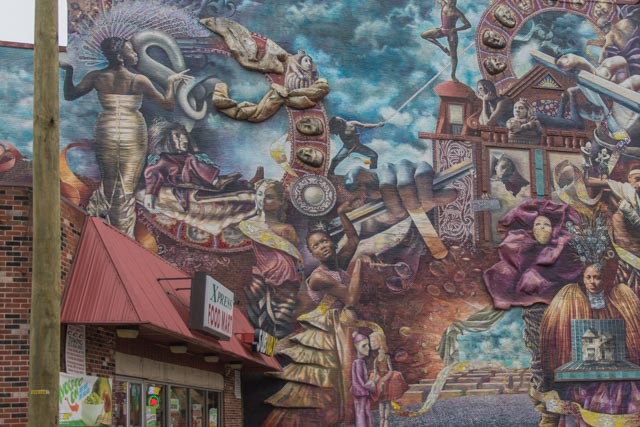 In all, I captured 30 different works of art during my journey in Baltimore. As I was looking through the images I had a hard time selecting the ones I want to post in this blog. After a lot of thought, I settled on 10 images that seem to capture the essence of the street art in this community. I hope you enjoy the mélange of photographs that I selected. One of the areas that is still proving challenging is setting the correct exposure when there’s a bright background such as you find at midday. Several of these photographs clearly show that the highlights of the sky have been blown. Hopefully, as I gain more experience in using my camera I can avoid or at least minimize these blown highlights. One of the key things that I probably need to start doing is taking advantage of shooting during the golden hours of the day. All of the photography books I have read indicate that these are the best times to take photographs. The golden hour lasts for approximately one hour after sunrise and one hour before sunset. Since this blog is intended to document my photographic exploits and development, I hope that these pictures display some improvement in my technique. I’m looking forward to walking the streets of Washington DC in search of street art. This will be convenient for me since I live in northern Virginia near our nation’s capitol. Please come back to visit the C’est la vie blog to view those pictures near future. I recently traveled to Dakar Senegal for a brief visit. This was my first trip to Western Africa and I was very excited about the possibility of visiting the area where my ancestors probably originated. In particular I was anxious to visit Goree Island; the location of the infamous door of no return and the indoctrination camp for the captured Africans who would soon be slaves in the New World. The Dakar is located on the most western point of the African continent on the coast of the Atlantic Ocean. I visited there during the dry season and it was less than tropical. Senegal is also located to the south of the great Sahara desert and as a consequence it is probably drier than the country’s south of its location. I had an opportunity to travel by car to a neighboring city in Senegal and I noticed along the drive how dry and arid the landscape was. The city of Dakar is very unique and I thoroughly enjoyed my visit. The population is pretty much evenly divided between Christians and Muslims and interestingly enough everyone seems to get along very well. As a matter-of-fact Senegal is probably one of the most stable countries in Africa. The Republic of Senegal gained its independence from France in 1960 and since that time with very few exceptions the political environment has remained stable. Senegal is not an economic powerhouse by any means. It does however seem to have a fairly large base of Western and Chinese business interests along with local businesses that conduct trade and commerce throughout Africa. house and the door no return in this post. The colonel told me that at one time there were 25 buildings such as this on Gorée Island. The next day while I was sitting on the beach in Dakar, I noticed some women fishing along the tidal pools. As I sat there watching them I managed to take several pictures of them fishing. When they finished I walked over to them and asked if I could take a picture of them with their catch. Turns out they were fishing for sea urchins. You can see pictures of them and the sea urchins in this post. I also managed to take a few pictures of some street scenes, along with a small market in one of Dakar’s neighborhoods. I managed to take quite a few other photos but I decided to limit the number of pictures in this blog post. Generally speaking I was pleased with the photographs that I did take and when I got back home they required minimal post-processing with Adobe Lightroom. My pictures still need a lot of work and now that Spring is here I hope to be out taking more pictures. My immediate goal is to work on improving my compositions. I recently purchased a book on photographic compositions and hopefully I will make some improvements that you can see in the next post. I decided to try something different for the 2014 New Year’s Celebration because I wanted to focus on my new photography hobby. Old Alexandria, a town in Virginia across the river from Washington, D.C., has a First Night Celebration featuring many venues for the whole family and concludes with a fireworks show over the harbor. I decided to try my hand at taking photos of the fireworks. The price of tripods seemed to be a little expensive and since I had blown my Christmas budget, I decided to shoot handheld! This was going to be a challenge, so I visited a couple of photography websites and researched shooting fireworks. All of the experts strongly recommended using a tripod. Interestingly,I did read one article that said you should try to brace yourself against something solid if you didn’t have a tripod. That was to be my plan. When the time came for the fireworks show, I was lucky enough to see a parked pickup truck with a great view of the show. I set my Canon camera to Shutter Priority and 800 ISO and then braced myself against the pickup truck’s bed. I then noticed it was a police pickup truck! Since it was a solid foundation, I thought, what the heck and starting shooting from my new fully braced position. Fortunately, the police must have been busy somewhere else or asleep in the cab because I was not chased away by them. The pictures came out fairly nice considering my setup and rudimentary skill level. Take a look on the Everyday Photos page and see for yourself. I am looking forward to my next photo outing and hope to improve on the quality of my photographs. Keep shooting! This is my first post on C’est la vie, a blog tracking my progress as an amateur photographer. I hope it is an entertaining visit for you. I retired from active work several years ago. As time went by, I got involved in a small business that has been very rewarding psychologically. In other words I have not made much money with it, but it is fun! Late last year, I decided to pick up a new hobby, since my business did not keep me too busy. I remembered enjoying a photography class I had in college 30 years ago! So I thought photography would be a good hobby. When I was in college we used primarily black and white film, yes that forgotten photographic medium! After taking a roll of exposures, we then went into a dark room full of trays of chemicals and developed our prints. Now between college and last year, I did own a couple of point and shoot cameras, so I knew that some significant changes in photography had taken place in the intervening years. I bought a Canon Rebel T3, a few lenses, camera bag and some other odds and ends. My wife and I then took an extended trip overseas and I got to use my new camera and accessories. By the way, who needed to read an instruction manual? I did! Unfortunately, I merely skimmed thru it before deciding that shooting in Manual Mode was the way to go. It turned out that using a digital SLR was not quite as easy as I thought. After a day of touring and shooting, I would review my photos on my tablet and find out that many of them were crap! Fortunately, I decided to buy a book for my Kindle and went to work reading and studying it at a furious pace. After a few more days, I finally started to take a few photos that you could look at without getting an upset stomach or the giggles. What was the problem? Basically, I didn’t understand how a DSLR light meter worked and I was taking too many pictures in poor lighting situations. Low light and hard light were my downfall. Think about it, I was traveling and going to museums, churches and other dark places. It was the summer, so the outdoor photos were in full sun and afternoon sun at that (why wake up early when traveling?). I think you can feel my pain by now! Ok, enough of an introduction to C’est la vie. I am going to learn how to use this camera and take some great photographs some day. You can join me as I progress by checking the blog occasionally. Most of the pictures I will post are going to focus (pun intended) on ordinary, everyday things. No great works of art, after all my theme is C’est la vie.